Despite the fact that it had one of the shortest careers of any trading port along the east or south coasts of Australia, Port Albert nevertheless played a very important role in the settlement of the country. Apart from providing initial access to the magnificent pastoral region of East Gippsland, for many years it was also the gateway to the gold-diggings high in the Snowy Mountains at Omeo. At one time one of the most prominent ports between Sydney and Melbourne, it now shares the fate of the gold-fields, having slipped into obscurity. Port Albert has an interesting history which highlights the differences between government and private enterprise in early colonial days. This difference retarded the growth of the country considerably. Investors became reluctant to sink their money into promising schemes, for there was a decided risk that as soon as the project became viable it would be taken over by government instrumentalities with little, if any, compensation. It was this, as much as any other factor, which delayed the development of Port Albert, and although in its heyday it saw much trade pass across its wharves, such prosperity was to be only temporary. The port declined as quickly as it had grown. Although the principal explorers came over the mountains from the north, the first attempts to explore Gippsland were made along the coast. In 1837 and 1838 a vicious drought raged in New South Wales. Settlers desperately sought new pastures and most eyes turned south to more temperate climes. Rumours of magnificent grazing lands locked between the high peaks of the Snowy Mountains and the coastal waters of Bass Strait had long been heard, and many of the southern pastoralists contemplated expeditions to cross the barrier mountains and open up this report paradise. to skirt round the towering mountains along the coastal flats. He crossed the Snowy River and reached Gippsland in the vicinity of the present site of Lakes Entrance. But his success was to be short-lived, for the expedition was consistently harassed by blacks and eventually had to abandon the cattle and return along the coast. The supply ship, in the meantime, had been wrecked near Wingen Inlet with the loss of all hands. Another station employee, Angus Macmillan, was sent by his employer, Lachlan Macalister, to find the new pastures. The dour Scot, used to the mountains of his Isle of Skye homeland, chose to travel over the snow-capped ranges. His sole companion was an Aboriginal of the Maneroo tribe, Jimmy Gibber, and together the black and white adventurers crossed the ranges to the present site of Buchan. From the top of Haystack Mountain Macmillan saw the magnificent expanse of the Gippsland Plains country and realised that the rumours were not exaggerated. It was a magnificent region. But at this point the local Aboriginals again caused problems. The savage Warrigal tribe terrified even the stolid Jimmy Gibber, who turned tail and disappeared into the bush, leaving Macmillan with the unattractive prospect of pushing on alone. The Scot was a shrewd man and saw little future in getting himself killed. He returned to New South Wales and reported his discoveries to Macalister who immediately organised another expedition. Late in 1839 Angus Macmillan led the first white settlers into Gippsland and established a cattle station on the Tambo River. Aware that the hazardous route he had followed through the mountains would not provide a supply route for a new settlement, Macmillan pressed on towards the coast, intent on finding a port which could be developed as a supply base. After more than a year of difficult exploration he located the site of Port Albert and established a base now known as the 'Old Port', close to the site of the present town. and The Sisters, picked up the survivors and, while in the area, made a brief exploration of the waterway as a potential port. Their report must have been good. An expedition was mounted and sailed for Corner Inlet to explore the possibilities of establishing a trading port. After weeks of searching for a suitable site this party selected a spot on the banks of the Albert River that was, by remarkable coincidence, exactly the spot chosen by Angus Macmillan and his band only a few weeks before. With both groups unaware of each other's existence, yet selecting the same spot for the location of a port, there was no question that this was the ideal spot. A settlement was established which would later be named Port Albert. Within a month or so, ships began arriving at the new port. The forty-tonne cutter Jane and Emma brought supplies from Melbourne for Macmillan's party, and the schooner Isabella arrived shortly afterwards with a government surveyor, bullocks and stores. Because of the difficult channel, some marker buoys had been laid earlier, but these were blown away in a storm and each ship had to ‘feel' her way up the narrow passage to the new port site. So tricky was the navigation that it took one ship three days from the entrance to the port! reserved for a government township. For all the Governor's good intentions in preventing large-scale speculation in the new town, the immediate effect was to bring the development of Port Albert to a standstill. The Gippsland Company tried to sell off its assets in the area and many settlers packed up and left. However, the magnificent hinterland country continued to develop as a prime rural area, and soon its flourishing economy began to improve the fortunes of Port Albert. Shipments of cattle and sheep to Tasmania were made regularly under the supervision of Angus Macmillan who, by this time, was a station owner himself. Incoming shipments of bricks and supplies also helped to establish the small settlement and develop the port. During this period, the centre of activity moved from the original 'Old Port' settlement to a more suitable site nearby, where it exists to this day, and the port began to flourish. In the first six months of 1844 no less than forty-eight ships entered Port Albert, establishing it as an important maritime centre. The fortunes of the town and its port rocketed in the 1850s with the discovery of gold in the mountains behind Gippsland. Wharves, hotels and other official structures appeared, and in the later 1850s the Port Albert Steam Navigation Company was formed with a small fleet of steamers, lighters and tugs. 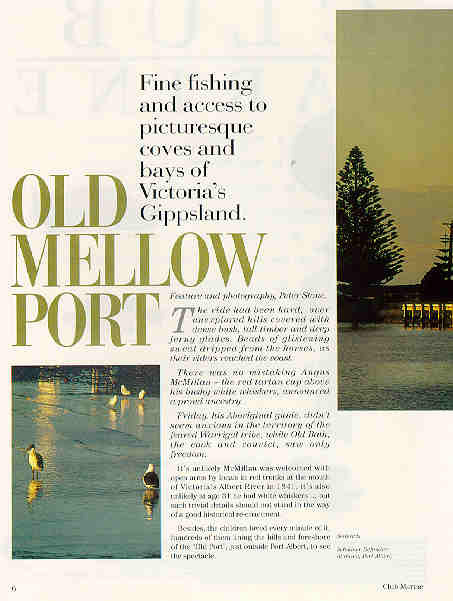 As the only port with access to the gold-fields and the pastoral region of Gippsland, the little port in Corner Inlet was set to carve its name into the history of the nation. Indeed, so meteoric was its rise that plans for a second port at nearby Welshpool were mooted. These did not progress at the time but, by an ironic twist of fate, Welshpool is today the thriving port of Corner Inlet, while Port Albert has sunk to ghost port status. of this country's pioneer history. Chapter 22 from Ghost Ports of Australia, by Jeff Toghill. The Macmillan Company of Australia, 1984. Important: Permission to reproduce the article has not been granted. Macmillan advise that author Jeff Togill has copyright. An attempt to correspond with Mr Toghill via his company in Sydney has not met with any response after two letters. Responsibility for the reproduction of this article lies soley with the webmaster. The Gippsland Regional Museum, its office bearers and members are not responsible for the reproduction of the article. It is reproduced here in the interests and education of the community. No commercial gain is sought. Enter on the page for an extract from a magazine feature.